BEARD PAPA has a special deal for you for a memorable Christmas. 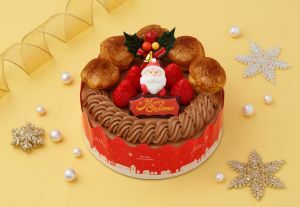 Order before December 20th, and receive a 300 yen discount on select delicious Christmas cakes. Complete an order form and hand it to the BEARD PAPA staff. Prices range from 2,500 yen to 4,000 yen (less with our discount). BEARD PAPA is on the B1 floor of Yokosuka MORE's CITY, very close to the west exit of Yokosuka-chuo Station on Keikyu Line.